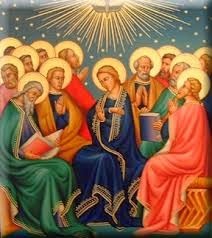 We are approaching the great feast of Pentecost. Do you ever wonder what was it like on that day in that room? What was it like in that moment when the Holy Spirit came upon them? What was life like for them after receiving the beautiful gifts of wisdom, understanding, knowledge, counsel, fortitude, piety, and fear of the Lord? They were transformed, and so transformed the world. Grant me the Spirit of Wisdom that I may despise the perishable things of this world and aspire only after the things that are eternal, the Spirit of Understanding to enlighten my mind with the light of Thy divine truth, the Spirit of Counsel that I may ever choose the surest way of pleasing God and gaining Heaven, the Spirit of Fortitude that I may bear my cross with Thee, and that I may overcome with courage all the obstacles that oppose my salvation, the Spirit of Knowledge that I may know God and know myself and grow perfect in the science of the Saints, the Spirit of Piety that I may find the service of God sweet and amiable, the Spirit of Fear that I may be filled with a loving reverence towards God, and may dread in any way to displease Him.